Paspalum setaceum Michx. Fl. Bor. Am. 1: 43. 1803. Stems 8'-21/2° tall, slender. Sheaths and blades very pubescent, the latter 3'-8' long, 1"-3" wide, erect or ascending; racemes 1 1/2'-3 1/2' long, more or less curved, generally solitary, occasionally 2, on a long-exserted slender peduncle, with 1 or 2 additional shorter peduncles from the same upper sheath; spikelets about 3/4" long, broadly obovate; the first scale 3-nerved, pubescent, with glandular hairs, the second scale 2-nerved, the midnerve rarely if ever present, glabrous or nearly so. In dry fields, New Hampshire to Nebraska. Florida and Texas. Ascends to 2200 ft. in Virginia. Aug.-Sept. Beard-grass. Pitchfork-grass. Paspalum Muhlenbergii Nash, in Britton, Man. 75. 1901. 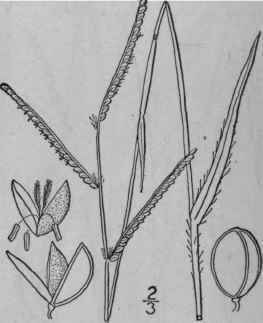 A tufted branching perennial, with pubescent narrow leaf-blades, and glabrous spikelets. Culms at first erect, finally reclining, 1 1/4°-2 1/2° long; sheaths commonly pubescent all over with long hairs, or sometimes only on the margins; blades flat, of medium texture, more or less pubescent on both surfaces with long hairs, linear to linear-lanceolate, 8' long or less, 3 1/2"-6" wide; racemes single or in pairs, 2'-4' long, the rachis less than i" wide; spikelets in pairs, about 1" long and less than 1" wide, oval or broadly obovate, the 2 outer scales 3-nerved, or the second one rarely 2-nerved by the suppression of the midnerve. In fields or in sandy or stony ground, New Hampshire to Florida and Texas. Aug.-Oct.
Paspalum debile Michx. Fl. Bor. Am. 1: 44. 1803. 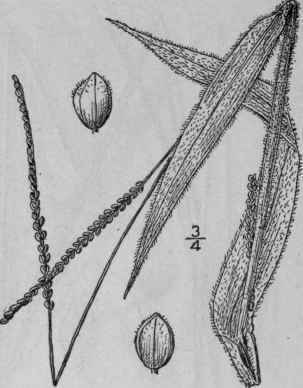 Paspalum supinum Bosc; Poir. in Lam. Encycl. A tufted branching yellowish green perennial, with flat leaf-blades which are pubescent with long yellowish hairs, and pubescent spike-lets. Culms 8-2° tall, stout; leaves densely pubescent with long yellowish spreading hairs; blades flat, thick, lanceolate, 8' long or less, usually 5"-10" broad; racemes usually but little exserted, in 2's or 3's on the main culm, single on the branches, 1 1/2-4' long, rather stout, the rachis about 1/2" wide; spikelets in pairs, about 1" long and a little less than 1" wide, broadly obovate, the first scale usually more or less pubescent with glandular-tipped hairs, 3-nerved, the second scale glabrous, commonly 2-nerved. In dry sandy places, South Carolina to Missouri, south to Florida and Texas. June-Sept.
285. 1820. Paspalum australe Nash, in Britton, Man. 1039. 1901. 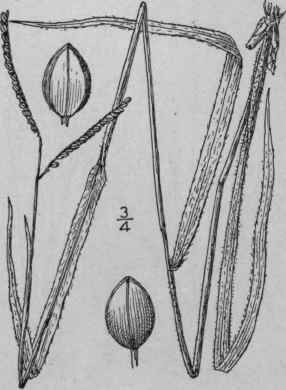 A nearly glabrous perennial, with flat leaf-blades and glabrous spikelets. 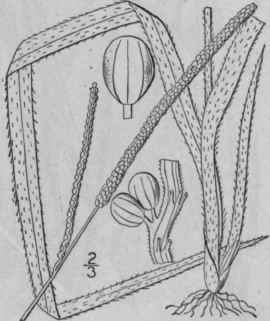 Culms 1°-3° tall; leaf-sheaths glabrous, or hirsute on the margins, compressed; blades up to 16' long, 2 1/2"-4" wide, erect or nearly so, often drooping at the apex, glabrous, or the upper surface more or less hairy; racemes 2-6, 1 1/4'-4' long, the rachis less than 1/2" wide; spikelets singly disposed, 1 1/4"- 1 1/2" long and 1"-1 1/4" wide, oval, the outer 2 scales firm, 5-nerved, the lateral nerves approximate. In fields and sandy, places, Maryland to Florida and Texas.